The US stock market has defied the odds this year, or so it appears, by running hotter and staying calmer for longer than expected, based on a variety of risk metrics. It’s unclear if this is due to a failure of the risk metrics, irrational exuberance run amuck, or both. The CAPE ratio for instance – a measure of the market’s valuation – has been elevated in recent history, rising to the second-highest level since the early 1930s. 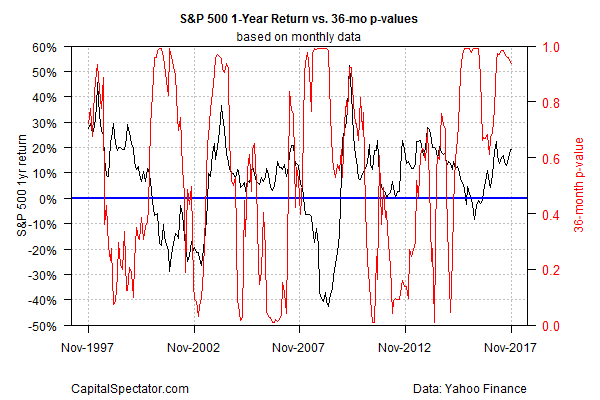 History suggests that the S&P 500’s expected return is low, perhaps negative, when CAPE is high. Alternative measures of stock market risk have been issuing warning signs this year as well. An econometric estimate of bubble risk, for instance, has been flashing red for months. Back in February, for example, the data suggested that the potential for trouble was on the rise. Mr. Market, however, apparently didn’t get the memo. The S&P 500 has continued to rise, with minimal volatility along the way. 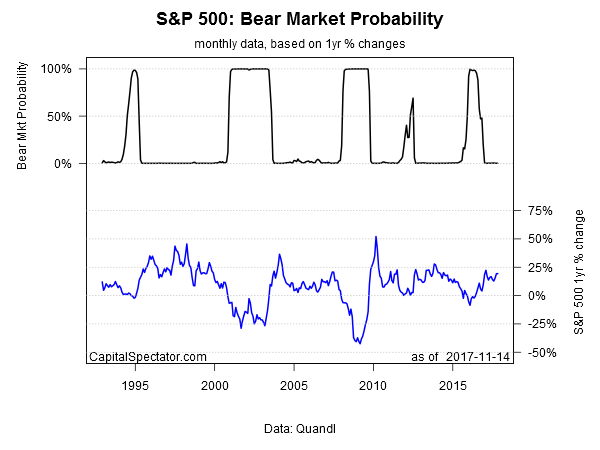 An econometric estimate of bear/bull regimes via a Hidden Markov modelconfirms that the trend has been your friend in 2017. Confused? You’re not alone. The value of risk management vis-à-vis the US stock market has been on holiday this year, prompting some pundits to wonder if the concept has hit a wall. Anything’s possible, but managing expectations is no less important for risk management. In particular, it’s all about probabilities, which is to say that estimating risk is risky, too. Or, to state the obvious, there are no 100% probabilities when it comes to projecting the potential for trouble. As such, risk management – in all its guises – is destined for some degree of failure at times. Then again, if you’re expecting instant gratification and flawless signals with risk-management tools, you’re expecting too much. Investing would certainly be easier if we had foolproof methods to estimate risk, draw conclusions, and reap the rewards in due course. But risk management is risky, too. None of this matters if you’re genuinely a long-term investor with the stomach to ignore steep drawdowns. But for everyone else, some aspect of risk management is essential, and there’s a price tag. Risk-managed portfolios tend to generate softer returns in the short run during bull markets compared with portfolios that are set loose with no oversight. The same may be true in the long run, too. So, what’s the point? Smoothing over the rough edges in short run, if only to keep an investor on track for a long-run plan. Rising prices aren’t a constant, even if recent history suggests otherwise. Like house insurance and keeping an umbrella handy, there are times when being prepared for regime shift delivers a handsome payout. Ultimately, the rationale for practicing some risk-management analysis is bound up with the empirical fact that market history repeats, albeit without a pre-determined time table. High-priced assets beget low and negative returns, and vice versa… eventually. Accordingly, prudent investors make reasonable rebalancing decisions based on a clear-eyed view of risk through time. It could be different this time, of course. But betting the farm on the notion that risk is no longer relevant isn’t investing or even speculation – it’s hallucinating.